Fab-Tech’s proprietary fluoropolymer coated stainless steel fume exhaust duct carries clear benefits across an array of industrial and scientific research applications. Given its status as the material of choice for venting corrosive fumes in semiconductor manufacturing, research lab owners in private and university settings have taken note and are now following suit. Depending on the research being conducted, most labs require ultra-sanitary conditions throughout, which means specialized materials of construction for their process equipment and process piping. Specialized coatings like borosilicate glass, glass-lined steel, exotic alloys, and fluoropolymers are often used for this purpose. Research labs must also follow strict interior air quality standards. As a result, these spaces often need the same sanitary and anti-corrosive measures in their process ventilation and fume exhaust systems as they use with their lab equipment. These venting solutions - whether general exhaust systems, or snorkel vents at individual equipment stations - must be constructed to withstand potentially highly corrosive vapors. In the past, research lab owners had to settle for fiberglass reinforced plastic (FRP duct) for their fume exhaust needs. The problem is that these systems often do not achieve the same level and range of corrosion resistance as the equipment it's designed to serve. 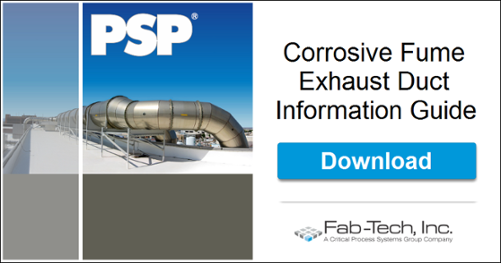 Disparities in corrosive fume handling between process equipment and fume exhaust duct can lead to unnecessary and costly production shutdowns. Even if all process equipment is operating at peak performance, any leaks or degradation of the exhaust system could compromise valuable time and yield, if not entire operations. Therefore, when evaluating the material cost of fume exhaust duct for research lab applications, it is advisable for lab owners to factor some of the indirect costs associated with materials like FRP duct. 1) Disposal Costs - In an end-of-use scenario, certain types of FRP duct may be considered hazardous waste based on the amount and types of hazardous chemicals that have permeated the material. 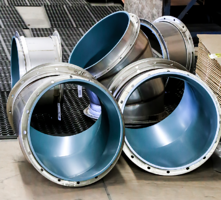 2) Maintenance Costs - FRP duct requires routine maintenance and coatings to all joints and spools over the lifetime of the system to ensure adequate exhaust containment. Such maintenance or repair efforts can incur significant labor costs as well as downtime costs. 3) Fire Safety Costs - Fiberglass duct requires the application of specialized fire retardant resins and/or fire prevention methods such as costly in-duct-sprinkler systems and wastewater infrastructure. Insurance costs for these systems also come at a premium. 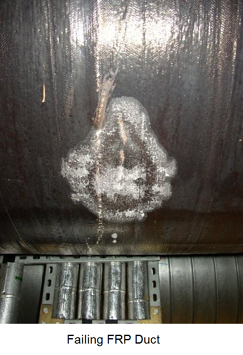 4) Specialized Labor Costs - Virtually all maintenance, repair, and support system installation for FRP exhaust duct requires the use of specialized labor to handle and apply the noxious resins that are needed for such work. 5) Installation Costs - In addition to specialized labor costs, fiberglass duct installation can take a considerable amount of time, as shown in this video. And we all know time is money.